New Clitheroe Cricket Club captain Peter Dibb is anticipating an exciting season ahead for the former champions. The 32-year-old, who made his first XI debut for the club against Barnoldswick in 2004, will take over the reins following the departure of Jack Dewhurst, who has become Padiham’s paid man. Dibb, who has skippered Clitheroe to Ribblesdale Cricket League glory in the past, will welcome Read wicket-keeper Kyle O’Connor into the squad after Kurt Robinson returned to the Arbories. Pakistani professional Fawad Alam won’t be returning for the 2019 campaign, having tabled 1,695 runs and 97 wickets in a couple of seasons at Chatburn Road, while Joshua Marquet has made the decision to return to Australia. Instead, the club have brought in 34-year-old Sri-Lankan Suraj Randiv, who plays first-class cricket for Sinhalese Sports Club. “We’re expecting a very exciting season,” said Dibb. “A few lads have moved on, which has left a huge opportunity for a number of young and senior players to show the ability that we believe they have. “We have a new pro in Suraj Randiv, who will offer a different and high class option for our side. “It will be important to work hard and gel as a unit as quickly as possible. Elsewhere, after going 14 years without a major trophy, Read’s first XI manager John Walker feels a change is coming. The club last won the Ramsbottom Cup in 2003, adding the Ribblesdale Cricket League crown for a third-successive time the following year. The Whalley Road outfit, who landed the Twenty20 trophy in 2014, have been close a number of times, securing a spot in the Lancashire Knockout Cup in the process. But it’s been an all too familiar case of ‘always the bridesmaid, never the bride’. 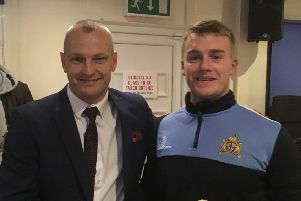 Walker, who had to say farewell to Brad Graham, Kyle O’Connor, Michael Whalley and Oliver Newby, said: “After a period of being contenders and not quite getting over the line, I think this could be the year to bring a trophy or two back to Whalley Road. “Despite a few changes in personnel, some of the newer members of the squad have become accustomed to the club and the league format in the last couple of years, so the experience needs to come to the fore. “The change in professional brings Luke Jongwe from Zimbabwe, with international one-day experience, and our overseas amateur, Luke Powell, also looks like a useful addition.